Printable Invoices for WP e-Commerce allows you to send detailed invoices along with (or instead of) the Purchase Receipt for each sale. 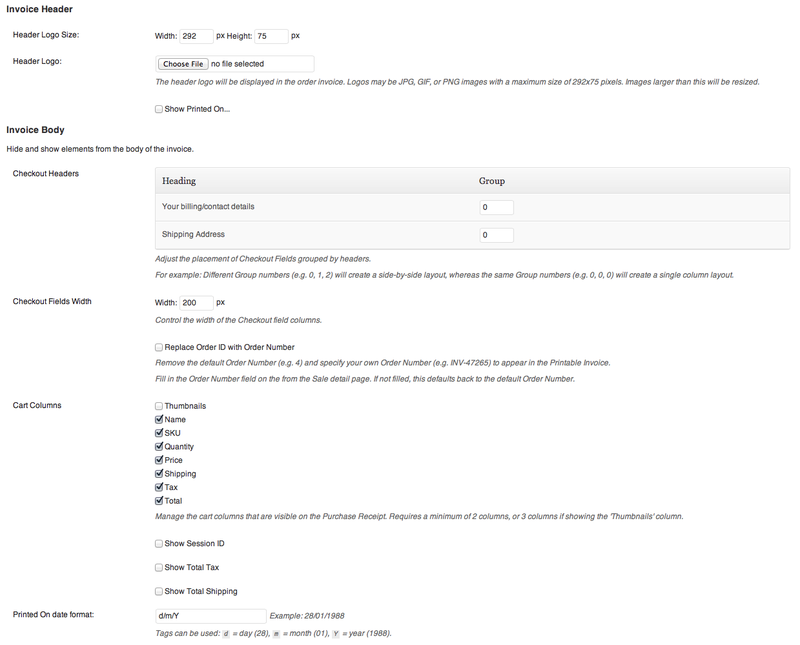 Looking for support, a copy of the readme, Plugin updates, Ideas or usage instructions? 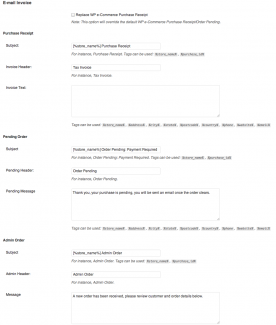 Check out our Documentation for Printable Invoices. 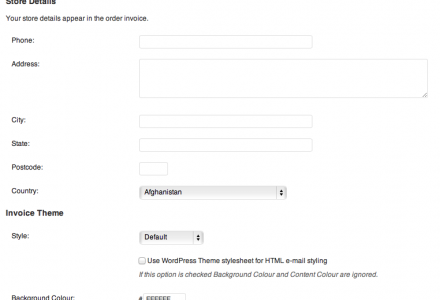 I’ve set the managers in my wp-ecommerce store with an ‘editor’ role. Because of that, they can’t get access to the purchase logs to print out the packing slip/receipt details to send to customers. Does this plugin enable that? 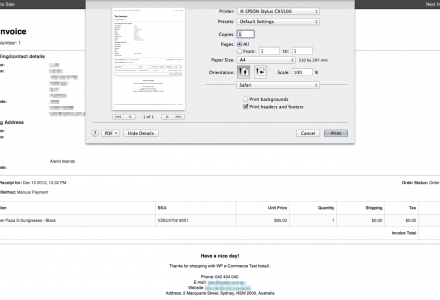 Will my ‘editor’ role managers be able to get access to the printable invoice/receipts? Hello, I just installed this on the newest version of WPEC. Invoices look much better than stock. I’ve found two minor issues I hope you can help address to make this work properly. 1 – WPEC is still sending generic invoice even though I ticked “Replace WP e-Commerce Purchase Receipt”. Sends both invoices. 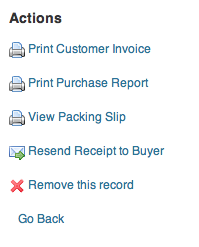 2 – When I click “Resend Receipt to Buyer” it sends the general/basic invoice, not the Printable version. Bonus- When I try to include %session_id% it does not show. May be a nice inclusion for next update. 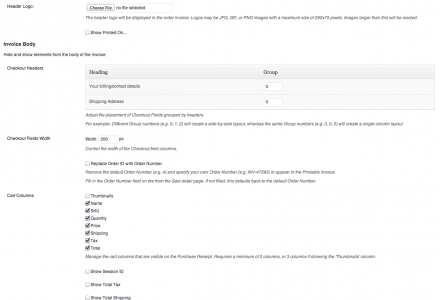 Purchased your plugin thinking it would send the invoice to both admin and the customer. The customer still gets the default wp ecommerce receipt (and not the printable invoice version) and the admin gets both the wp ecommerce receipt and the printable invoice plugin receipt (which shows all of the html code so is impossible to read). Can you please help me fix???? 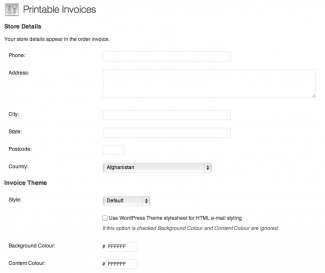 Hi Abbey, please update to the 1.6.5 Plugin update that resolves conflicts with WP e-Commerce’s own invoice engine. Can I send an invoice along with the Purchase Receipt sent to the customer? Sure can, support for sending a Printable Invoice along with the Purchase Receipt at Checkout has been added in the 1.5.2 Plugin update. 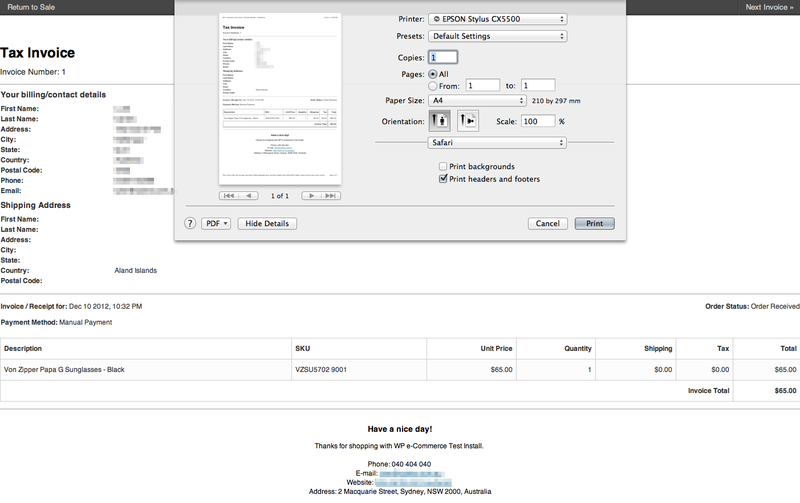 You can even replace the standard WP e-Commerce Purchase Receipt with Printable Invoices if you choose to. 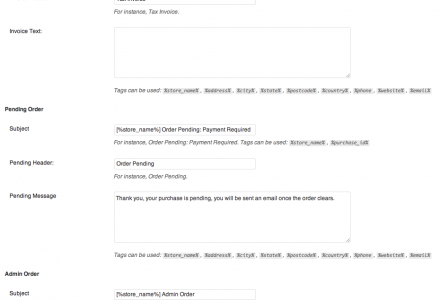 Can the styled invoices from this plugin completely replace the plain text purchase receipt? Sure can. Please find the "Replace Purchase Receipt..." option under Settings > Printable Invoices. 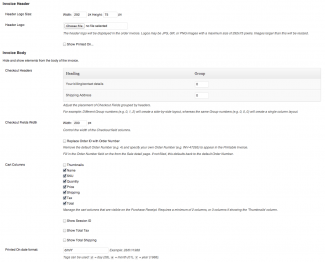 This will replace the default WP e-Commerce Purchase Receipt template with the one you view via Dashboard > Manage Sales. 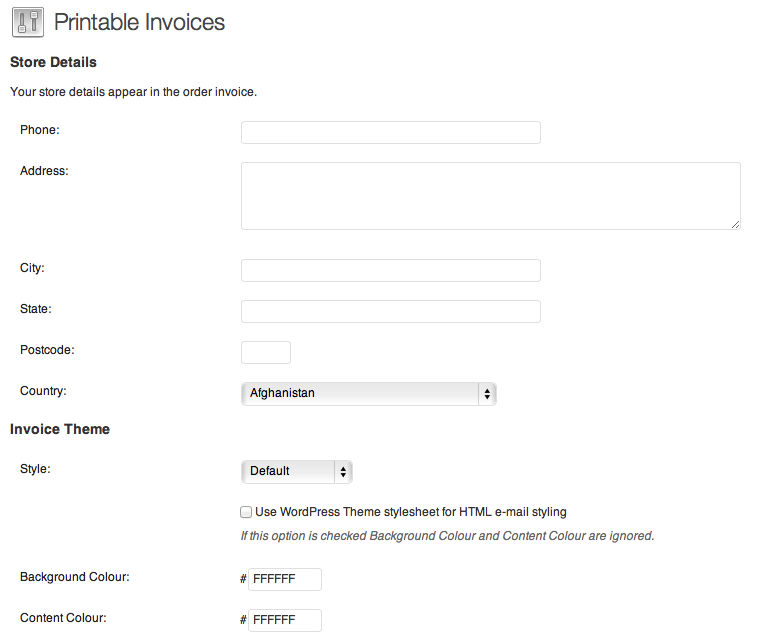 Printable Invoices comes with a Quick Start document (readme.txt) to help with installing the Plugin. 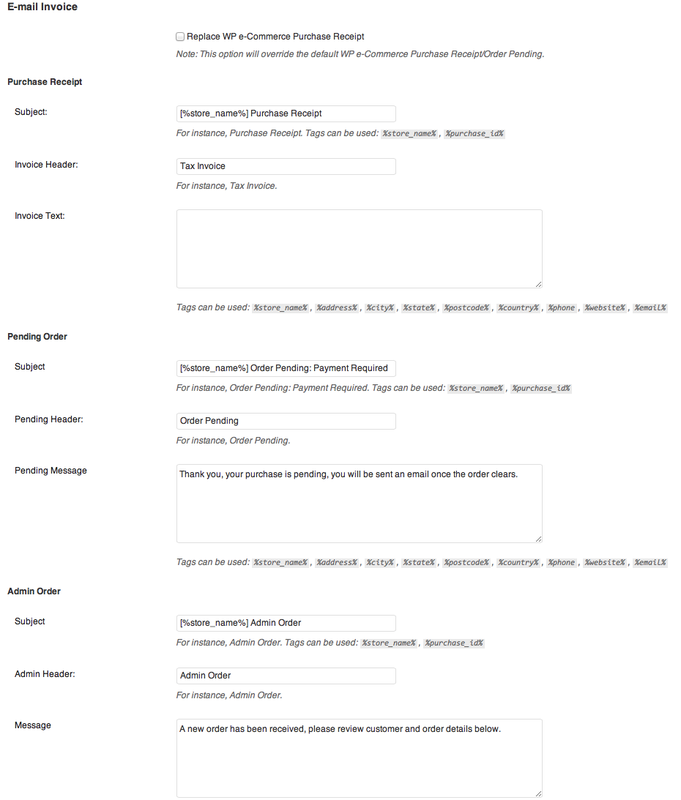 Additional support can be found from the Contact page or methods below. If you have any problems, questions or suggestions please join the members discussion on our Printable Invoices forum. Provide detailed sale invoices from WP e-Commerce to your customers in printed or electronic form. 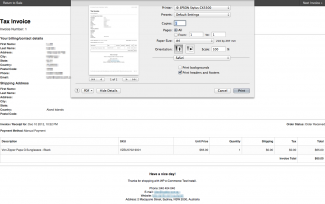 To customise the Printable Invoices template. To view the Printable Invoice for a Sale.